Prevent editors from deleting "system content"
Sometimes you have content, e.g. pages, that's necessary for the website to run. This could be the startpage, news archive page, search page and so on. Let's call them 'system content'. Now, if you want to prevent your editors from accidentally deleting these pages you could change the permissions to these pages. The downside with using the regular content permissions is that you have to stop the inheritance of the permissions, and not just that, you also need to reset them again for every child page that you want the editors to able to delete. This gets unmanageable after a while. So what can we do instead? Well, we could hook in to the content events in the content repository and then stop them from being deleted. First we define an interface to mark all content types that should not be deleted. ///     as system content. System content should not be deleted by editors e.g..
Then we decorate our content types. But hey, wouldn't it be nice if we could delete them anyway, in like special cases? Let's create some special permissions, Permission to Functions to the rescue. Follow the guide in the link above to give the permissions more meaningfull descriptions by also creating translations. Now we can create an initializable module that will actually prevent editors from deleting 'system content' or allow them if they have enough permissions. The Version gadget will unfortunately not display our CancelReason message when deleting a language version, but if you try to delete the content (master language), then our message will be displayed. I you're using the Language add-on, then the add-on will just throw an error when you delete a language. I wish the Language add-on would handle this better, but hey, it will at least stop the editors from deleting the language version. 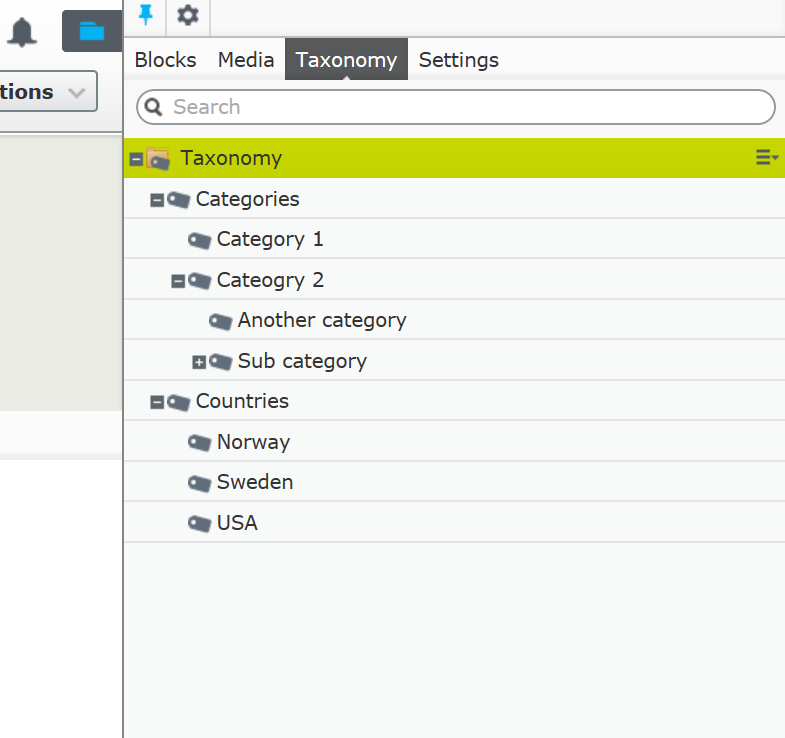 Since I started working with Episerver back in 2008 I've been missing better taxonomy support, that and a "bucket" feature where we can put content that doesn't fit into a content tree, but in this post I will just cover taxonomy (buckets might be my next challenge though). If you're like me, you've probably always wondered why you need admin access to just administer categories and why it's so cumbersome to translate them. Well, you don't have to anymore! Head over to GitHub and check my new project out at https://github.com/JohanPetersson/episerver-taxonomy. You'll find more information at GitHub, but in short this Add-on gives editors a new UI to manage taxonomy and us, developers, a new way to define different types of taxonomy. The Add-on is not release in a public feed yet, I would like to have some feedback and implement a few more features before releasing 1.0. So please check it out and leave comments here or on GitHub. Lets say you want to give your editors the possibility to select a user (username) in a property so we can display e.g. a byline in an article. The simple solution is to just add a string property to your page type, but then the editor need to enter the username manually. Instead we can use the AutoSuggestSelection attribute, then we only need to implement an ISelectionQuery. Fortunately there is an API in Episerver we can use to query for users, IQueryableNotificationUsers, but keep in mind that the API is internal and may change without notice. I couldn't find constants for all Episerver action icons located here http://ux.episerver.com/ anywhere in Episerver or on the Internet. So I thought I would share those with you. These are really useful if you e.g. are using this solution.